Part of modern card collecting is that many of us look for ways to make a little bit of money out of it. And that's great. Now let's get one thing straight, there's no easy way to profit off of cards. What works for one person isn't going to work for long if 50 others do the exact same thing. However, there are some ways to make money selling sports cards that are easier than others. Flipping cards on COMC is one of them. It's no get-rich-quick method, but it's not difficult or tricky to do either. That is, unless you consider clicking a computer mouse to be a complex task. The big plus that COMC has over other online sellers is that all cards are held by the company. Usually, it's thought of as a way to simplify shipping and the costs associated with it as you're buying from one place. 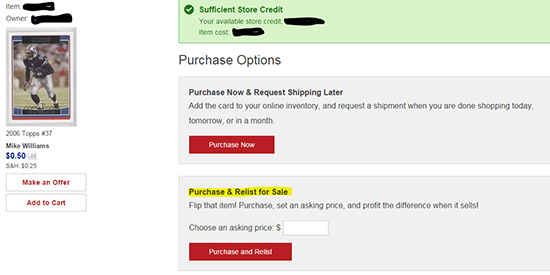 But the COMC platform makes it easy to buy a card on the site and then relist it for a higher asking price. Basically, if you see a deal or something you speculate is on the rise, you can buy it whether you want it for your collection or not. Within a few seconds, that card can be back on the site for a higher price -- ideally one that will make you a little money in the process. Sell Your Sports Cards and Memorabilia to Us. Flipping cards means that you're buying them to turn around and sell them. If you flip something successfully, you come out ahead. Depending on the amount of your initial investment and the time it takes you to make the sale, even a small profit can be considered successful. It's not like there's much labor involved. In order to buy cards to flip on COMC, make sure that you're logged in when you go to buy something. You also need a balance in your account. When you see a card you feel is worth trying to flip, you proceed to click the "Buy Now" button. This puts the card into your account and offers a few options. You can have the card shipped to you. It can also be set aside for a later shipment. Finally, there's the option to relist the item. This is where you need to look if you're going to flip it the card. Simply put in the price you want for the card (hopefully more than you paid) and that's it. Now you just sit back and wait to see if it sells again. It's not just single cards that can be flipped either. There are always sellers looking to move larger inventories through port sales. If the entire package looks good, you can strike a deal and buy in bulk. Similar to a single-card sale, those move into your account and you can set new prices if you wish. Just like anything else, purchasing in bulk can lead to better deals. But it does take a little extra savvy to go through and break down how much you might be able to make from a portfolio. Buying and reselling on COMC is easy. That's the most obvious perk. It doesn't take a lot of thought. It doesn't take a lot of effort. But note, it's the actual act of flipping that's easy. Making money? That's never easy. Flipping on COMC can be a hobby for some. It can be enjoyable to browse through cards, find something you think can be turned into a profit, buy it and relist it. Even if this doesn't amount to a paycheck in your account balance, it can be an affordable way to have a little fun. Another big perk for flippers is that, in many ways, there are fewer costs involved. You've got the cost of the card and little else. When cards are originally sent in to COMC, sellers have to pay listing fees up front. While they're reasonable when you stop to consider all the steps and labored involved, plus what you get, these fees have to be paid up front before a card is live on the site let alone sold. Buying and relisting a card doesn't involve any of these fees. All you pay is the price of the card plus a storage fee of $0.01 per card per month. So unless you're overpaying for a card, it's hard not to see the upside. Just like anything in the hobby when it comes to making money, there are no sure things. You can't just hop onto COMC, buy something and expect to turn a profit. You need a strategy. You need to try things out and see what works and what doesn't. That said, there are a couple of things to consider that can minimize the risks. The first is to target sales. Some sellers offer some hefty discounts in order to make a quick sale. If you're patient, you can turn that into some easy profits if it's a card that has an audience. Another place to look is prospects who are likely to move up. Many of these might already be hot, but if you can predict call-ups a month or so in advance, there is still some room to cash in. What it all boils down to is buying low and selling high -- at least higher than what you paid. Keep your expectations in place too. It's unlikely you're going to find a card on the site for $5 and sell it two days later for $100. COMC might not be where you make that big instant profit, but if you're making $0.30 on the dollar within a month or so, it can add up. Even still, for some, it might be too time consuming given the returns. Another consideration is the storage fees. All cards that are bought on the site and relisted are subject to the $0.01 fee if the listing price is higher than $0.75. If you're playing the long game and looking to make a $0.05 profit off a common, you might end up losing money when all is said and done. Even if you're not making a lot flipping on COMC, it actually can be fun. It lets you dig into cards a little more, even if you're not handling them. Just like going to a garage sale or flea market, there's always the potential to find a great deal or simply locate a cool addition to your collection. 2016 Panini Certified DAK PRESCOTT Rookie AUTOGRAPH AUTO 62 99 Cowboys *A BUY!!! 2015 PANINI CONTENDERS CRACKED ICE DeVANTE PARKER RC AUTO 13 23 BGS 9.5 10!! Doesn’t the 25 cents it costs to list a card make commons useless to sell on COMC? Mark � Not necessarily useless, but tougher to justify and harder to profit on. This article applies to buying the cards already on the site to flip and avoid the listing fee. I have cards to sell on COMC that are not part of my collection. I have cards from 1970-2018 All major sports. What ‘types’ of cards sell? Am I wasting my time trying to sell base 1975 hockey cards? Are more recent cards the ones that really sell well? Thanks for your help. I would say just to list what you are looking to get rid of and see what happens. Most things will eventually sell if priced correctly. 2015 Bowman Draft Baseball Jumbo Hobby Box - Factory Sealed! RookiesHQ!